I am so angry and happy and sad and generally all over the place with this book. 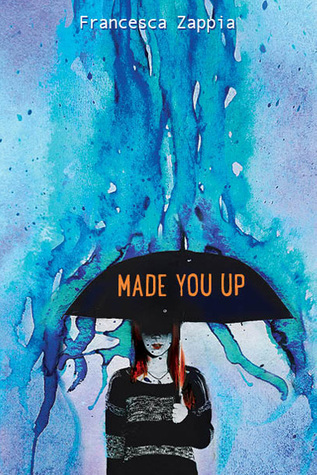 Here’s what I hate about MADE YOU UP: It’s real and it’s unpredictable and the people in it are people, not characters. I didn’t make that up. It’s true. They are real. There is nothing funny or cool about disorders like Asperger’s or autism or any other disorder, but I’m mentioning those in particular because meeting Miles in this story really messed me up a little. I wasn’t expecting him at all. I wasn’t expecting his character, his backstory, everything about him, but the reality of this story is that Miles probably makes and breaks MADE YOU UP for me. I’ve been around people with autism and other disorders like it. It’s no cakewalk, and something about reading Miles didn’t comfort me, but at the same time it did. It’s so hard to explain but to sum it up, I would say this: Miles is not a fun person to be around all the time. When I say that, I know that everyone has a non-rainbows and sunshine version of their personality, but the thing about Miles is that he just doesn’t get it. So much of the time, he doesn’t get it. I hate that, but I recognize it, and something about that conflicting emotion made me continue reading even when the pace slowed. Is he real, or is he not? That’s the whole premise behind MADE YOU UP basically. From the start of the story, I was 99.9% sure that Miles was real and that Alex would figure that out somewhere along the way. I won’t say anything for sure, but it’s the way she figures out the truth and the things that lead up to it that truly blew me away. There are some fantastic twists and turns to this story that fit right in line with the premise and the plot of this book. The supporting cast, Miles and Alex were spot on for MADE YOU UP. Alex’s struggle is apparent in every page, but it’s not wearing. It made me want to get to know Alex better, to sympathize with her. She’s a great, quirky character with her own flaws. Alex and Miles together was perfect, though sometimes weird or awkward (in a good way). Their romance is hilarious and relatable, and really not the typical YA love story. All I can say is really, when it comes to the plot, this book sneaks up on you. Its pacing can be slow at times, sure, and there were times when I wanted to stop reading this book, but between the fantastic dialogue, the lovable characters + supporting cast and Zappia’s writing, I had to continue. This story is a great read and one that I will be definitely be recommending. 4.5 stars. Silver Words Week: Paula Stokes, Author of LIARS, INC.